Are you trying to make a decision about the best project management software or collaboration software to use for your business? We love using Basecamp for its mind-bending simplicity, but it still leaves much to imagination. So what we did was put the most popular hosted software options under the microscope and compare must-haves and other essential features, such as mobile compatibility, price, and more. ProofHub – an online project management tool packed with amazing productivity features, an easy to use interface and a free trial. And, the super-handy mobile app lets you stay connected with your work on the go. Zoho Projects – a wide range of applications available on top of project management including CRM, calendar, chat and a wiki. Over 3 million users. Basecamp – It is the leading web-based project management tool. Not only is it popular, it is also very easy to use. Time Doctor currently has Basecamp time tracking, which allows managers to accurately track time spent on projects & other tasks, as well as monitoring individual team member’s productivity. Freshbooks – a very popular invoicing software solution for small business owners. Easily send invoices, track time, manage expenses, and get paid online. Smartsheet – project management, CRM and other features based around using online spreadsheets. Wrike – some unique features for teams of any size such as: customized workflows, updating tasks via email, and an interactive Gantt chart view of project plans. Teamwork.com – includes project tracking, contacts and calendar. We currently have a Time Doctor integration for Teamwork.com users, which allows managers to accurately track time spent on projects & other tasks, as well as monitoring individual team member’s productivity. Redbooth – includes a Twitter style updates feature. Nozbe – project management based around the David Allen “Getting Things Done” methodology. Active Collab – provides task management, collaboration, time tracking, reporting, and invoicing, so you can centralize most of your work in one tool. Harvest – focused on invoicing and time tracking, a competitor to Freshbooks. LiquidPlanner – ability to plan, track, schedule, and analyze an entire portfolio of projects in real-time. iMeet Central (formerly Central Desktop) – 425,000 users, includes real time integration between Microsoft office and the central workspace. Clarizen – brings together cross-company project management, configurable workflow automation, in-context collaboration and a tailored, role-based experience, all built on a secure, scalable enterprise platform. AceProject – a popular all around project and task management solution providing a great mix of ease of use with some higher-end functionality. 5pm – very colorful interface, and lots of features including time tracking, contacts and an iPhone app. Huddle – integrates with Microsoft Office so you can save Microsoft files directly to a shared workspace. Feng Office – includes solutions for project management time tracking, calendar and contacts. Comindwork – includes Gantt charts, and a business wiki. EGroupware – consists of multiple installable applications and includes a calendar app, address book, email, project management, timesheet and more. Deskaway – includes timesheets, calendar, contacts and a micro-blogging status update feature. Goplan – includes a Twitter like activity stream. Xtrant – is a cloud-based project platform that lets you share files, tasks and conversations in one secure online space to reduce email noise, increase accountability, and keep everyone on the same page. Hyperoffice – has a hosted email service and contact management. Visma Severa – includes CRM and invoicing. GenieBelt – Realtime project management tool that connects the construction site to the decision makers. It includes solutions for reporting, tracking, live project overview, and planning. ClickUp – brings teams of all specialities together in a clear and collaborative setting. You can customize it the way you want and it allows you to save more time by combining the tools you use every day in one platform. SwiftKanban, BeeWits, Attendance Software, TeamWork Live, Nirvana, Intervals, ProWorkflow, Teamly, Glasscubes, Copper, Workspace, Tenrox, Journyx, Clientspot, Vertabase, Celoxis, 24sevenoffice, PlanDone, Attask, Workzone, ProjectManager.com and CloudBooks. This is only about hosted SaaS online project management software. There are dozens other open source platforms which we didn’t include in this list, especially those that are not hosted (meaning, you have to install the software yourself). TaskReports has a handy comparison chart of project management tools that you might also want to check. We have also not included products that are more focused on CRM or products that are more of a bug tracker such as JIRA. We also excluded sites that did not have their pricing listed on their sites. We know that the ranking of sites is not completely accurate, but it’s the best we could find. Compete or Quantcast are other alternatives for ranking sites but we decided to use Alexa. Want more useful tools for your business? Check out the list of online collaboration tools we have compiled for remote teams. I bｅlieve this internet site holds very superb composed articⅼes content. Good way of describing,and pleasant paragraph to get information on the topic of my presentation topic, which i am goinhg to present in academy. No doubt Trello is a good choice and it's free, but recently we tried Plutio which is an all-in-one project management tool that does invoicing, proposals, and much more. We have also tried Gitscrum and is really amazing. Both these tools are highly recommended by startups. I like the list very much, thanks for sharing!Although I've heard about some of the project management tools you mentioned for the first time, I'm always up for a good exploration. Very excited to check them out! :)Basecamp has been my go-to for a long time now, but my goals is to expand my scope to a few more tools.Lists like these are always helpful. Great list, tried some of it before like Zoho Projects alongside with Time Doctor. Now we're trying Plutio, it's relatively new but it's nice since they are building the app through peoples suggestions. Great information. Since last week, I am gathering details about project management experience. There are some amazing details on your blog which I didn’t know. Thanks. Hey Liam and Rob, It’s no easy task to compile an informative list of project management tools, so Kudos to the research you’ve come out with. Project specializations happen by the minute, which is why it helps to have the right hands on deck and prevent any last minute frantic scramble. This is where Saviom stands out. At the right price, you get to unearth true staff potential and generate resource-centric decisions that’ll secure you that project windfall you have your eye on. That’s quite a compilation of popular project management software. But I believe this coverage missed other tools like ProProfs Project. I have been using this simple project management software for the past 10 months without burning a hole in my pocket.After its integration to our workspace, we’ve been able to collaborate in real-time. Our clients are happy about how we always stay in touch with them about every update through the tool. Also, we’ve been delivering project deliverable on, or before the deadlines arrive. Since its use, I’ve been recommending this software to our clients and other colleagues to manage their projects efficiently. Grand list of project management tools that serve different industries as some might not be exclusively PM software solution. Some do come with time tracking, billing and invoicing while other include business reporting and dashboards to run your day to day accounting.I'll love to see more! This is a great list of tools for project management. The best part is this article is that tool is arranged on the basis of Alexa ranking which means more accurate list. Thanks for the information. Great list and sorting them via Alexa is very helpful. Just to help you for future references Hitask is also a very efficient tool for project management. REALLY important to look at what exactly you define as a 'project management tool'. Some of the solutions in this list are meant for the true PMO, or project management office - while some are collaboration work management (CWM) solutions. There is a blend of the two spaces happening in 2017, but as the CWM space grows there will be more of a gap.If collaboration across departments, external stakeholders, and across geo locations is important I would recommend a CWM tool that is easy for everyone to start using - like ProjectPlace (not on list. )If your goal is to have a tool that gives you in depth reporting as to where you're at within a project then look for the real Project Management tools in this list (like Clarizen). For those who are looking for project management alternatives, you can check out Zillable. It is an awesome virtual collaboration platform and a project management web application that can help you manage your VAs. You can also use it for free so check it out at https://www.zillable.com/! 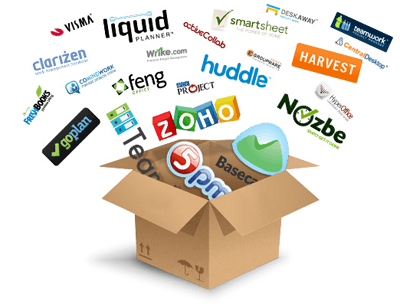 Great and amazing collection of software here thanks for listed for business and project management tools. Some tools here are that you have listed i was unfamiliar form this. In all of them, time tracking software is very useful for me. Nice post keep up. Proofhub is already on the list. Thanks! These is an awesome article. Very well researched. I would like to add another valuable software that needs equally beside project management to run it successfully which is time tracker named Buddy Punch (https://buddypunch.com) You can track your employees time for a certain project and save lot of money and resources. As a IT company owner, the Slickpie(www.slickpie.com) free accounting software has been a lifesaver. It helps me to organize my expenses, send invoices, and accept payments. Whenever I had questions the support staff have been brilliant. Every time I call they answer on the first ring. I'd suggest you try this Agile Board Software, http://reqtest.com/features/agile-board, it's worth a check. The ease of use in incredible and it does what it states and is there for. I have also found a good lead management system .For only one time fee http://dealsmanager.net. Hi, followed your link from one of you comments on another Blog, mind checking out Dooster.net? its what we are currently using and are quite happy with, would be good to see how it measures up. Problem with this tool is the resource management and tracking time. No straight forward way. Also the top pack does not contain unlimited user feature. We are using https://www.spmlive.com/ . Take a look, highly recommended. Great list, Rob! I have a new release that would be a great addition to this list. :)http://easydata.me is a powerful project management software app that provides simple and intuitive user interfaces for collecting textual data, numeric data, single choice answers, multiple choice answers, pictures, video, audio and GPS locations. Although I appreciate the effort involved; which of these offers automated planning (like Liquidplanner)? For me that's a must-have. Thank you for this great information. This is just great. We are considering Zoho Project (www.zoho.com), Plan First by BizFirst plantfirst.bizfirstonline.com and Basecamp (www.basecamp.com ). I cant decide which one to go – Zoho has great collaboration features and integration abilities, Plan First has in-depth functionality and super customization ability and Basecamp is well established it cannot go wrong. Any suggestions? I am struggling to pick – I need a lot of status reports to be sent everyday. Thats a nice list. One software that is missing here and which is very good is Producteev.com. It has a free version for Project management with unlimited internal and external users, workspaces, projects, tasks. Having tried Clarizen I would offer a word of caution. We found the sales team excellent in making promises but the customer support was unsuccessful in following thru. We got zero ROI with Clarizen. I eventually settled on 'Timely Projects' and really like it. Intuitive and powerful with all the features I was looking for. We are using http://www.comindware.com/tracker/ for few months and very happy with it. You can try also. If some of you who are looking for an all-in-one solution that offers time tracking, simple project management and invoicing, please take a look at <a href="http://www.paymoapp.com" rel="nofollow">Paymo</a>. I'm looking for a project management + CRM web/mobile app, maybe similar to asana but with location based task assignment function. Like sending a team to an address with task details. Anyone knows something like that? Rob, you should also take a look at RationalPlan suite: http://www.rationalplan.com/It is really easy to use and intuitive. It will help you plan a project in no time. And now there is also <a href="http://www.rationalplan.com/cloud-project-management-software.php" rel="nofollow">RationalPlan Cloud</a> which is online SaaS. Looking for an alternative to Basecamp that has all the same features, but also includes dependencies between tasks and the ability to assign tasks to two or more people. Thoughts? I hate joint responsibility (single point of responsibility is the watchword at Foliovision) but the project management tool we use Teamwork does offer <a href="https://foliovision.com/?s=teamwork" rel="nofollow">dependencies and multiple assignees for tasks</a> . To my great regret: I've even asked for a preference to turn off joint responsibility. Check out SmartSheet.com it is Amazing!!! I am pretty sure it might do what you want. Your chart is not accurate. For example, smart sheet does have gantt charts. Smart sheet DOES HAVE Gantt charts. I know because I have used them. The great thing about them is each individual can have their own and they as PM you can reference theirs so when they update their sheet yours updates automatically. Huge admin load of off updating sheets and keeping them timely and accurate. We are using https://www.spmlive.com/ for few months and very happy with it. You can try also. Please consider adding GTDNext (http://GTDNext.com) to your list next time you update this article.We are fairly new, but working very hard to create the best GTD based task management app on the market. We focus a little more on the advanced user with features like unlimited sub-tasks and automated next action lists and many more advanced features.Stop by and take a look. It is free to try. 2nd for Centrallo!! They officially launched last week, and it's helped my organize and prioritize dramatically. Can't recommend it enough. Velocity is designed for the needs of small businesses and freelancers. It provides requirement tracking, creation of quotes and invoices, time tracking and diagramming using draw.io. I would like to suggest a new project management software www.workasteam.com. Give a try to Comindware Project (http://www.comindware.com/project/ ). Project Management software allowing priority-based planning automation, real-time Gantt-chart, resources allocation and a bulk of collaboration options. It delivers less complexity than MS Project, but way more powerful than Basecamp. Hi, Great article with extensive list of tools. But I would like to suggest SwiftPPM from Digite, a comprehensive program and project portfolio management solution for an organization. Its rich set of features including task, defect, issue, timesheet, custom reports and many others along with wide integration capability have proved it to be the most worthy among various PM tool. I have been searching for a cost-effective web based solution for a while.I tried Jira but it as in built ticketing system. Then Redmine - way too much effort to set up. So then I looked at some of the ones listed above. Seems like people confuse task management with real project management. And they confuse a Gantt charts with task management!Then I tried qdPM based on the recommendation in the comments. Now I moved onto qdPM Extended (http://www.qdpm-ex.com)which is just about the best one yet. Talk about bang for your buck. This is a great solution for project managers - can handle tickets (helpdesk), changes, issues, tasks, schedule, reporting, calendars, wiki, documents. It is a one stop shop! Great list of available project Management tool. I would recommend you to add (http://workfinished.com ) Project Management tool to this list.Since a year I am using this tool to manage all my Projects and my teams, It is Awesome tool. go for it. Hi Rob, Great help and thanks for the effort. Last 6 months I have tried few of them, and few came very close to our requirement. By chance I discovered another great service Oogwave. I will say, perfect replacement for basecamp for me, as we start working on longer and larger projects with clients.Along with task and communication, best feature I like is file folder sharing structure like Google Drive, making it really easy to store and share files with clients in specific folders. I'd like to add Crocagile to this list. https://www.crocagile.com/home is an agile-inspired workspace that keeps your team together throughout the entire product life-cycle. It's a mix of collaboration, group chat, file sharing, and agile project management. Croc keeps you out of email, and your team in one place.Disclaimer: I'm a founder of Crocagile. We're currently in beta, accepting select teams who are willing to help us fine tune the experience. Also have a look at Psoda (http://www.psoda.com) - it compares very well with all of the tools listed in terms of breath of functionality. We gave up on MS Project after bashing our heads against it for years. We then tried Basecamp but found it didn't scale to the sort of complex work we do. Then we found HumanEdj - a Web app for large projects including people from different organizations. Very easy to use but provides the sort of features you get in heavyweight planning apps. You can take part in a project by email which is great if some people in the team don't want to adopt new tools. Over time you can build up a library of plan templates which we are now making good use of - we're even thinking of selling some of ours. There's a free version online (www.rolemodellers.com). This was a good resource for my research paper. I look forward to the advancement of project management especially within game development.I am wondering though, how does Time Doctor compare to these other products? This is a very complete list, but you have missed one tool: 10,000ft! It's a resource planning and project management software to manage people, time and money. You can plan, track and analyse in a very simple and flexible way, while having the key information about the state of your business to make important strategic decisions. Another tool I would like to add is Brightpod ( http://brightpod.com ). An easy to use project , task management app with bunch of collaboration features specifically for marketing teams. Helps you get the bigger picture when you are working on so many different things. That was an excellent blog. You made some great points.You have given a good information about different time management software. But I would like to recommend http://www.timewriter.com I am using it from last 6 months. Thanks Nick, this Casual visual workflow approach to scheduling seems quite original. I assume there's no pricing because it's a Beta. Good bye, Basecamp! Good bye, Asana and Trello! Let's say the same to JIRA too. Why?askcow is on the way. Seriously??? Asana has a team of 37 amazing people, founded by an ex-facebook developer. I recently visited the offices of Atlassian (Jira) where they have a whole floor of amazing developers.What makes you think that you even have a chance?And who chose the name "ask cow"?I mean there is some space for competitors in the Project management space, but it's a very crowded space, with some amazing people building applications. So it's really arrogant for anyone to think they can do a better job. Wow.!!! What a fantastic information!!!! We are using a tool called http://www.workfinished.com/ it has saved us literally thousands of $. I would like to add this workfinished.com tool to this list. Now a days Project management is playing a great role in all the industries. Because of this Project Management tool will help us to keep tracking on all the projects. I don't see AtTask which is a SAAS PM tool and rated by Gartner in the upper right quadrant. Has anyone had any experience with AtTask? I am using Proofhub since 2 years. Because of its features like time tracking, privacy and inbulit chat helped me a lot to carry out my work. I think that this tool should also be there in your list as it contains amazing collaboration features. It is a nice comprehensive list, but I guess the list is out of date now... Clarizen for example has file/doc sharing, WiKi, Billing, create tasks via e-mail, dependencies, Gantt charts, contacts, iPhone app etc and is cheaper than stated. So the list is quite misleading...I guess with technology moving on that most of the others might also be out of date, and should have improved over the last few years. I'm using qdPM. It's free project management. I'm using it more then 1 year and I like it! FYI, Clarizen appears to have Gantt charts. http://www.clarizen.com/project-software/features/core-project-management-features/gantt-charts.htmlFWIW, I have no connection to them, and haven't used their software. Hi guys, great list. I recommend also very useful comparision of web based project managment softwares: <a href="https://www.easyredmine.com/best-web-based-project-management-software" rel="nofollow">https://www.easyredmine.com/best-web-based-project-management-software</a>. Please put in further information like open source, language, cloud application, mobile apps, and etc. Thank you for including www.wrike.com in your post, Rob! Can you please update your Google Doc, since there is some inaccurate info about Wrike? To be more precise – our app has milestones, recurring tasks and Google docs integration, as well as mobile apps for iOS and Android. Thank you! Hi, I've used bootcamp before and I believe you can set up recurring tasks. Your chart says "no".I am wondering if anyone can tell me if any of these solutions offer the ability to track projects and share files - including video files.thanks. Wrike and 5pm are some project management software's that sound interesting to me, not because they have got free versions, but they are as good as Basecamp. We currently use Replicon. Thanks for sharing! SaaS tools are really helpful for distributed teams like us. We use clockodo (http://www.clockodo.com) in addition to JIRA, that combination is perfect for us. Can anyone tell me if any of these software has the following feature: my company provides subtitling services. We have a project with 168 movies to subtitle. I would like to be able to make a list of all the movies and their deadlines and have my team access it so that each subtitler can pick the movies s/he wants to subtitle. Maybe in a calendar format? Ideally, they would auto-assign each job like this in live mode, similar to those systems for purchasing theatre tickets: you see what is available at that time and pick/click what you want. Does this make sense? Thanks for the help. saying freshbooks is "project management" software is exaggeration to the extreme...it does little more than invoicing. Time tracking is limited, you can't track multiple hourly rates against a total fee budget; either you set the fee and forget about your hours, or you set the hours and forget about more than one hourly rate. You can't set up multiple tasks with a set fee for each task, something which is fairly critical for project management. No calendar or timelines of any sort, no milestones. Freshbooks Classic does have quite a bit of support ticket/helpdesk functionality. New Freshbooks apparently sneaks into project management quietly. Agree that freshbooks is not really project management, so doesn't exactly fit into the category, but a useful alternative for people interested in invoicing. I am a user of 5PM and noticed some erroneous entries in the comparison table on google doc:milestones, recurring tasks, invoicing/billing, expense tracking and task dependencies do NOT exist in 5PM. Hi Sandra, you can edit the document: https://docs.google.com/spreadsheet/ccc?key=0Ahw066SJeeSadFJGWXRTUVVfaE1WWmpkU09WUkt6Z0E#gid=0 -if there are specific things you think need changing thanks! Great list, I have also tried loads of different alternatives in my days. Today we use [link removed] at work. To me it is the most complete tool. The interface used to be a little ugly but they fixed that a while back, looking great now. So if you are looking for a powerful tool i would highly recommend [link removed] if you just need a simple task management tool i like http://do.com. And if you are just into software devel http://www.yodiz.com is nice. Planbox.com is also pretty nifty for agile software devel projects. But all in all i would go with projectplace. We are using a tool called http://www.taskbiller.com it has saved us literally thousands of euro of otherwise un billed tasks for clients. From task assignment to billing of both the client and invoicing from the resource it allows us to spin many plates and not miss a beat. They do a free signup for 30 tasks to try it out and the best thing, no annoying per seat plans that quickly drive up costs. Good list. However I'd like to add one more. ProjectVision http://www.corasystems.com is a web-based Portfolio and Project Management Software solution, empowering control and visibility over Business Plans, Strategic Objectives, Programs and Projects. Very extensive List. But I noticed you are missing Clockmeister(http://www.Clockmeister.com/) on that list. When will the list of features be updated on the Google doc? I am noticing that Central Desktop has more features than what you have listed and I know Basecamp has also gone through an overhaul? You should add Comindware to this list too. Great product, very useful and simple in using with alot of their own features. I have been used for about 5 different tools, but stopped on this product. If you haven't tried it yet - try. Wow, that's a comprehensive list. I just released a site in this space that takes a different approach. It mashes up a PM system with gaming awards that lets you level up at work. See it here: http://propstoyou.com. You see, I've used these things for 20 years -- long before they arrived on the web -- and the one thing that never changes is that they're boring as watching paint dry and people never use them for long. I'm hoping to change that. Check it out! Great resource for those looking to implement the right project management application for their business. Another one to the consider is Trakeze http://www.trakeze.com/. It's a web-based system that includes easy-to-use project planning, Gantt charts, task management, requirements management, time tracking, CRM, and collaboration applications. I came across this PM tool,BootStrapToday at http://www.bootstraptoday.com. I have been using it since few weeks and found it very useful for high end developers. It adds intelligence to the processes and automation and integration are yet unique features. Apart from the cloud based model it is also available as In-house set up. I am planning to install one. Would you give me suggestions on installing In-house set up. We are using Celoxis (http://www.celoxis.com) for more than a year now and are quite satisfied. A very comprehensive product. Especially like their interactive gantt. It's the best that I've ever seen in a web based product. Reports are quite good and so is their "workflow" component. Highly recommended. Awesome list! It's so nice to have variety out there. I will check out some of them for sure. I just want to bring some attention to the latest and greatest I have been introduced to <a href="http://www.PureProjectTools.com" rel="nofollow">www.PureProjectTools.com</a>. It's the one site that I have found that is able to handle the capacity of my work and it's super intuitive which is great for my company, since I don't have the time to train everyone - especially since not all my workers are situated in the same city. This tool is free, which is a big plus too. I am a certified project manager and have been introduced to many PM softwares and this is hands down the best one I have found. I came across this PM tool,BootStrapToday at www.bootstraptoday.com. I have been using it since few weeks and found it very useful for high end developers. It adds intelligence to the processes and automation and integration are yet unique features. Apart from the cloud based model it is also available as In-house set up. I am planning to install one. Would you give me suggestions on installing In-house set up. Thank you for including <a href="http://www.vertabase.com" rel="nofollow">Vertabase project management software</a> to your list.What differentiates us from other project management software is that Vertabase offers a comprehensive tool set while still being intuitive for both non-technical and technical users. Every phase of the project lifecycle can be managed with these tools. From brainstorming to reporting to completion and closing, Vertabase covers the lifecycle completely. Thanks for all your hard work compiling this list! I might add, you certainly have eye catching, attractive graphics on your website. I wanted to share www.projectmanager.com with readers also. I particularly like the customisable dashboard which gives a graphical view of your project, it has other neat features including a interative Gantt chart and mobile apps. Thanks! I just discovered Asana: http://asana.com/ It appears to be free. I'm not affiliated with Asana and I just started using it. However, I think it has a beautiful interface, seems intuitive, and built for power users. Is the spreadsheet still open to collaboration? When I open it, it is read only. Awesome resource, by the way. Thank you. Nice list of alternative products! You might also want to consider the Replicon Time tracking software. http://www.replicon.com/time-tracking-software.aspx. Great interface and quite affordable. Thanks for this list, Could anyone here please suggest a tool which can work in our own corporate network without a need to reach any external servers? The point is that we already use one of the web-based products for our task and time management, but we suffer from low performance during peak hours. All we are trying to find is effective tool that is low-cost (or semi-free), without too profound project features, but that allows us to manage and share tasks without all that possible "loading" problems that we face on the web (we prefer something that can be transferred into our own inhouse LAN). thank you! Yup great list. My co-workers and I built http://www.startmission.com because we wanted to reproduce the features of basecamp and freshbooks in one system. So that's something to consider too. <b>For me, it's down to Dooster versus TeamBox versus TeamLab.</b>I don't really need the collaboration aspect so much... just the ability to track tasks for my three to four freelance projects. So the ultimate system would be a $10/month (or free) version of Basecamp. I like Basecamp, but don't want to spend $25/month. One thing Basecamp has that I don't always see offered on other programs is the "Task Lists" feature, which I like.I tried <b>Dooster</b> several months ago, but based on some of the posts, I'm going to check it out again. I like the fact that it integrates with Gmail Calendar, but it seemed to have made a mess of my calendar. Perhaps it's just some configuring I need to do on my part.<b>TeamBox</b> seems nice, but I'm not sure I like the "Tasks across all projects" page. I prefer to have the tasks separated under their own projects, instead of interwoven among projects.I just discovered <b>TeamLab</b>, but can't figure out why I keep seeing "Unsorted Tasks", where Basecamp would have a task list. Again, this might be a newbie issue. This program appears to be the most promising at this moment, but I've only been on it today. There's obviously a million PM packages out there but I really like Pure Project Tools http://www.pureprojecttools.com because it lets me quickly see the status of my projects from a dashboard. Wow! What a long list - and there are so many more out there. Personally, I vote for Clarizen. www.clarizen.com/ProjectSoftware.aspx It is just the best online project management program for real-time updates and effective team collaboration. It is flexible and not too difficult to use, plus their support team is excellent. Thanks for the input Rachel! We've had great success using <a href="http://dooster.net/" rel="nofollow">Dooster</a> to <a href="https://dooster.tenderapp.com/kb/google-integration-syncing/connecting-your-google-calendar" rel="nofollow">integrate Google Calendar</a>. Our catering company has a busy schedule, and Dooster keeps our projects and tasks on track. Hi, good review. Do you want to check out http://www.projectframework.com ? Great PS Software to automatically create project documents in Word and Excel. I've been using ProjectFramework for some time - from www.projectframework.com - a new tool capable to cover from Project Scope to automatic Documents/Deliverables generation in MS Word and Excel (50+ IT Documents available) ready to be handed out directly to the Customer. The tool is capable of generating automatically even Professional Services and Software Sales proposals. For IT Consultants and Freelance, 30 days free trial available. Anyone have experience with PM software integration into Google Calendar? Great review! Concerto do a fully customisable solution so you don't need to have three different pieces of software to do get all the functionality you need. It does everything from automated invoice and budget tracking to planning and implementing large scale strategies to measuring the resources available on a day to day basis. Great piece of software, we find it very useful in the office. Probably, these are competing players at the market.But i wonder why you've excluded workforcetrack. It suits small companies pretty well. Very good review. I have experience on basecamp and MS project ( so glad indeed). Also I found a program called "eTaskMan". After I try, it is not bad eventhough it is in beta. I think should add into the list. Seroge, Sounds like you are in construction. What suggestions do you have that are suitable for Critical Path, RFIs and payments tracking? thanks. Lots of choices. Another great tool is Workgroups (http://www.metacommunications.com/products/workgroups/) it integrates four separate mix and match modules to tailor the software to your business needs. It includes solution for job/financial management, workflow and scheduling, proofing and review, and digital asset management. It's really a flexible and advanced in comparison to other PM solutions out there. I'd like to add our product: FLUFF-LESS is a rather new and modern PM and collaboration tool targeted towards freelancers and small businesses; features include time tracking, a calendar, todo-lists, document sharing, a powerful search function and email notifications. Hi,You just missed proofhub. its web based project management software provides to dos, milestone, time tracking, proofing, real time chat etc. I'm looking for a simple online collaboration / project tool that I could use with my renovation contractor on a 4 month project expanding our home. Would like to keep track of deadlines, invoices, milestones, some photos and documents. He has a Mac and uses an iPad and iPhone at the project site, and I and my wife have Macs plus I have an iPhone. There is also an architect involved - don't think he uses mobile devices but does use internet. I travel a lot on business and will be updated or consulted on decisions, and don't want to end up with zillions of emails back and forth. Basecamp? Something simpler? Anyone have relevant experience?Thanks. Good Request Peter, I have similar needs from the other side: I work as an Owner's Representative aka Project Manager, advising owners on Residential construction projects. I am looking for a simple Mac friendly software to track Critical Path , RFIs (Requests for Info), and payments. There are way too many choices, hard to tell which ones are suited for construction. I used to have a large constr. company and we used Sage, way complex. Right now I use eTaskMan (http://www.etaskman.com). In my opinion, it should also be added in the list because it is free web-based system (very convenient) and easy to use. You should consider adding APINI which combines PPM, knowledge base and DMS together. That's such a long list. Thanks for the research. At the beginning of the year after having avoided taking on new software we got into such a tangle when the business started growing that we had to take a look at some online task managers. We didn't have the time to look at many and my boss just decided on http://www.dooster.net and away we went. It has been easy to learn and we like it. What I like is that the partners are so much easier to deal with now that we have some cohesion again. The atmosphere had been getting bad and I was practically flinching if just asked for something. Anyway, that's changed now as Dooster.net has been a great success for us so I'm giving it a mention as well as a big thumbs up. Hello!Recently I've been using projectino.com for online collaboration and small project management. You can there create projects, create tasks within the project, assign tasks to people,set due dates for tasks and the project itself and there is a place to write notes back and forth about the project. Good news is that the basic plan is for free. Really bueno review, bit I also can´t find the platform we use for project management. In our organization we use TeamLab http://www.teamlab.com/ and I should say, that we are satisfied with the variety of tools it offers - online document editing and sharing, tasks, milestones, time tracking, etc. Ok smarty pants, if our article is unhelpful then your comment is EXTREMELY unhelpful : )You mentioned "missing some of the best software in the space" … um which ones? Getflow.com probably the only exception I can think of. If there are there others you feel we've missed please let us know.Remember that this is a ranking of the most popular subscription based SaaS alternatives. Yes there are way more than 43 project management software alternatives, however there are few that we have missed (at least in terms of site usage).Also I challenge you to find a more comprehensive article on the alternatives.If our article is lacking, please point to an article with more comprehensive information, we have certainly not found it. You missed more than just one! Moreover this list of features is pointless. It is not whether a product HAS a feature that is important, it is HOW the feature is implemented that counts.I see you also exclude most of the best software in the space because you cannot be bothered to do a deep investigation. This is just a cheap plug for your own software and anyone who thinks it represents any sort of analysis that they can rely on is just too lazy to do their own research. What's a pity is that the spreadsheet is not up to date. We use Teamwork and at least half of the missing features have now been implemented.Thank you though Time Doctor. I know just how time consuming <a href="https://foliovision.com/2013/04/basecamp-v-teamworkpm" rel="nofollow">a project management tool comparison like this</a> can be. And I only compared two. What a useful and comprehensive round-up. I have added it to the 'Useful Links' section of my own PM for Freelancers site. @Henner - Where do you see a $99/yr plan. Has the price just gone up since this list was created and you added your comment? Great list! Another great addition would be Freedcamp which like TeamLab is also free for all the features BaseCamp offers. It offers a few features not seen by other project management applications like a Meebo Bar allowing you to chat with your friends and colleagues while managing your projects. Nice review. There is another tool also - Manitoo. Could also be listed here.Bye, Dusan. Hi,You missed Apollo! http://www.apollohq.com Apollo is project management and CRM. It has cases&deals, timers, and a very powerful calendar.It would definitely be a good addition to your great article!Bye,Merc. You missed one :PSeriously though, I think WORKetc should qualify for this list, it was the system I went to as an alternative to Basecamp and it ended up changing my entire workflow. It combines multiple aspects of business management and because of this you can essentially manage your entire business under this platform alone. I manage the entire customer lifecycle within WORKetc - from lead, to client i'm working on projects for, to paying customer. You can also associate items with your projects, like to-dos, support cases, etc.It has gantt viewing, dependencies, and collaboration goes business wide in the application. I rest my case!! Nice compilation of alternative products. We would also recommend you to give Invoicera (http://www.invoicera.com) a try. It is an online invoicing and time tracking application with all the latest invoicing features. It supports 20 global payment gateways, supports multi language and currency option and also offers you to customize your invoice templates as you wish.